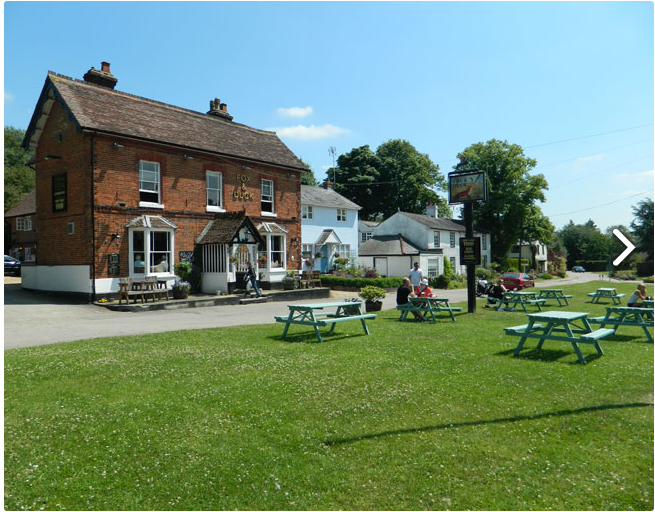 Last week, I visited The Fox and Duck, a pub not far from me in a village called Therfield in Hertfordshire. This was no ordinary review opportunity - the pub's owner Ivan Titmuss, who took over just 18 months ago, visited me to see what I thought of his uniquely brilliant wine list. When Ivan arrived, he became the 8th landlord in just 7 years, so the pressure was on to get things right. Things obviously needed to change. Being a Greene King pub, Ivan was limited on how he could tweak the beers on offer, and so he tackled the wine list. Oh, the pub wine list. So many times it's just a handful of the most recognisable reds and whites, maybe a sugary rosé thrown in for good measure, and some dusty bottles of Veuve behind the bar that never get bought. The wine grapes and styles might be familiar (New Zealand sauvignon, Chilean merlot) and the friendly pub prices might keep a large glass under a fiver, but the quality tends to be average at best. So what did Ivan do? He ignored the large-scale suppliers that most of the local pubs use, and went up to Norfolk, where he found a brilliant, small European wine trader who was happy to help him design his unique wine list with a focus on quality wines at all price points. It meant a glass of wine has gone up in price a bit, but once the locals began to taste his selections, they soon saw it's better to pay a little more for far more enjoyable wines that are actually better value for money. His supplier also trains his staff, and helps Ivan rotate the list 3 times a year so he can ensure his wines match his seasonal menus. If there's just a handful of red and white, you're doing it wrong, but equally heavy, leather-bound tomes of 1000 wines really only work in the most high-end establishments, the ones that attract people who only go to show off their wine smarts. The Fox and Duck has 9 reds, 9 whites, 2 rosés, 3 sparkling (including a sparkling rosé) and 3 dessert wines. It's diverse enough to be interesting but snappy enough to show a huge amount of thought has gone into the selection. In fact, there's actually a healthy selection of wines on the list that are exclusive to this pub. Recognisable regions might help shift wines with very little hassle on the part of the serving staff, but they often mean your punters have to pay rather a lot more money than they really need to for a good bottle of wine to share over dinner. Either that, or you have to pick cheaper examples that don't do the regions justice. The Fox and Duck has focussed most of its European-only list on less 'classic' regions like the south of France, Portugal and lesser-known areas of Spain and Italy. The only thing it maybe needs is a couple of offerings from Hungary, Bulgaria or Austria, but Ivan admits he didn't want to go too hard, too fast and scare the locals away. I'm sure these regions will crop up in future lists. The picture to the left shows the sharp, accessible layout of the wine list, and I think that's absolutely crucial to helping customers feel comfortable to explore the wines on offer, equipping a future generation of wine fans with more knowledge so they can make informed choices that gives lesser-known wines the attention they deserve. Not only does Ivan make it clear the 'colour' of the wine, he also mentions the region and the grape varieties involved, which really helps less savvy customers - as well as wine geeks like me. Suddenly, that 'Pouilly-Fumé' you've heard so much about is just a good quality sauvignon blanc from the Loire region of France, and the weird-sounding southern French wine you don't recognise turns out to be just a blend of some grapes you definitely do recognise, like sauvignon blanc, chardonnay and grenache blanc. Suddenly you're drinking sauvignon blanc that ISN'T from New Zealand, and ENJOYING IT! And tempranillo - a grape variety producing some cracking value wines from various countries - is suddenly given credit for being the main grape in a Rioja. Many would prefer wine to remain a daunting and elitist mystery, but the honesty and clarity of this wine list has suddenly made every wine completely accessible to everyone. If you ask me, this is an extremely BIG GOOD THING. 4. MORE WINES BY THE GLASS! Oh, this is so important! Stop picking tons of good wines that I have to buy a whole bottle of, pub owners! I can't afford it an end up drinking cheap crap that makes me sad. Ivan lists 15 of his 20-25 wines by the glass, which means not only can diners pick different glasses for different dishes of their meal, but also that - if they want to - they can choose to spend just £7-8 on a glass of the finer stuff as a treat, and maybe learn about which fine wines they like. Surely this is the best way to get them coming back to buy a whole bottle. I can't stress how massively important this is to get your customers (well, customers like me) to explore your wine list and realise just how good it is. Half of The Fox & Duck's wines are available for less than £20 a bottle - Ivan's clever choice of regions has made it possible to buy a very decent, enjoyable bottle without wincing at the price. There are a select number of £25-40 bottles too - so larger budgets and special occasions are covered - but it's always great to see a list of several desirable bottles you can actually afford without over-stretching yourself. Making good wines accessible to as many people as possible can only be a good thing. The three sweet wines are listed as part of the dessert menu. I was so pleased to see customers being encouraged to explore dessert wines - all three are very varied in style, and even currently include a delicious PX sherry! You're new to the town and you want to make some changes - great. But don't start presuming you know what your customers want better than they do, or they'll soon tell you. Ivan's an easygoing chap who is obviously popular with the locals. When the supplier sends him sample bottles, he leaves them out on the bar so his regulars can tell him exactly what they think. Imagine returning a week later and seeing the wine you selected on the list? Little touches like that are what makes this place special. A southern French example of my favourite grape variety, and this doesn't disappoint on any of viognier's classic characteristics: apricot, peach, pear and a nice spicy finish, with plenty of smooth, velvety texture. Aromatic and perfect for summer, or the pub's duck dish which comes with onion bhajis. I'm not a great fan of Portuguese wines or the albarino/alvarinho grape, so I wasn't eager to try this. Boy am I glad I did - this had a gorgeous, mineral, herby wine a lovely balance and mouthwatering freshness. I'll admit it, I actually don't recall having heard about the alfrocheiro grape before, but I know Terre D'Alter is a decent producer, so I was eager to give it a whirl. It was lovely and rich, spicy and warm, with hearty berry flavours. Perfect with the pub's Foxy Burger. This Italian red is from Salento, and is a blend of negroamaro and primitivo. It's Ivan's favourite wine on the list, and when he described it to me as 'sweet', I raised my eyebrows skeptically. But once I tasted it, I could definitely see what he meant - while this is a dry red wine, the fruit is incredibly sweet and concentrated, and the wine has a delicious, silky texture. I'd never have considered this wine without tasting it but it will be my top pick of the reds when I next go back to visit. This is living proof of what I mean when I say how important it is to encourage people to try wines they've never heard of. Ivan might be new to The Fox and Duck, but he certainly knows what he's doing. I only hope other pubs in my area - and across the rural parts of the UK as a whole - will begin following his lead soon.